Do you ever have one of those nights where you just can’t fall asleep … start thinking about everything under the sun? I had one of those nights … thought about new Christmas projects, chocolate, dirty laundry and Valentine Nutter Butter cookies! Easy as pie! 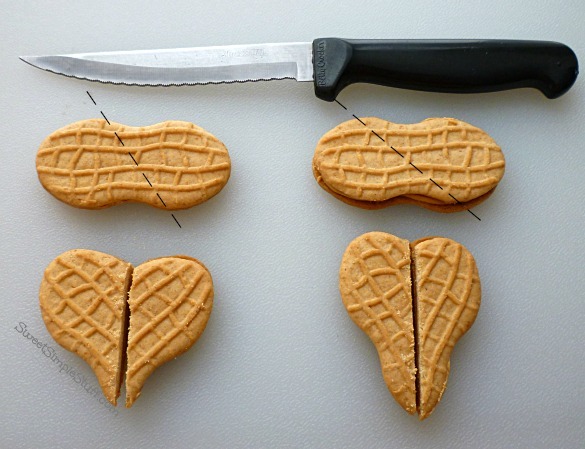 Cutting the cookie at different angles creates different shape hearts (as in the above photo). I used a gentle back and forth sawing motion and with a small serrated steak knife on a cutting board. Cover the paper pattern with wax paper. Use melted candy in a squeeze bottle or pastry bag to draw the outline (add pearls if desired) let it dry for a few minutes. Fill in the majority of the heart with melted candy. Place the Nutter Butter on the melted candy immediately, press the two halves together, push on the center seam if necessary. 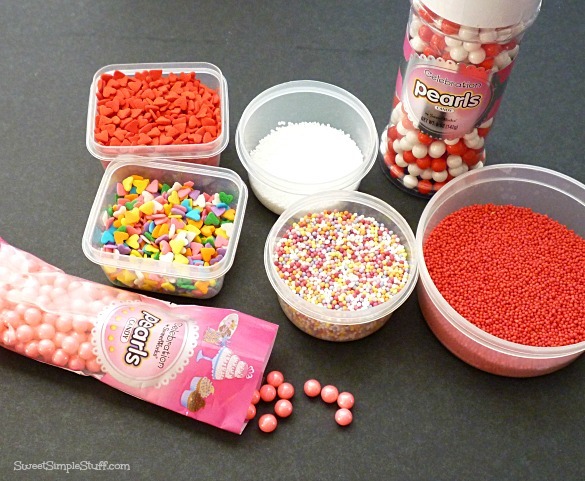 Drizzle with melted candy and add sprinkles. 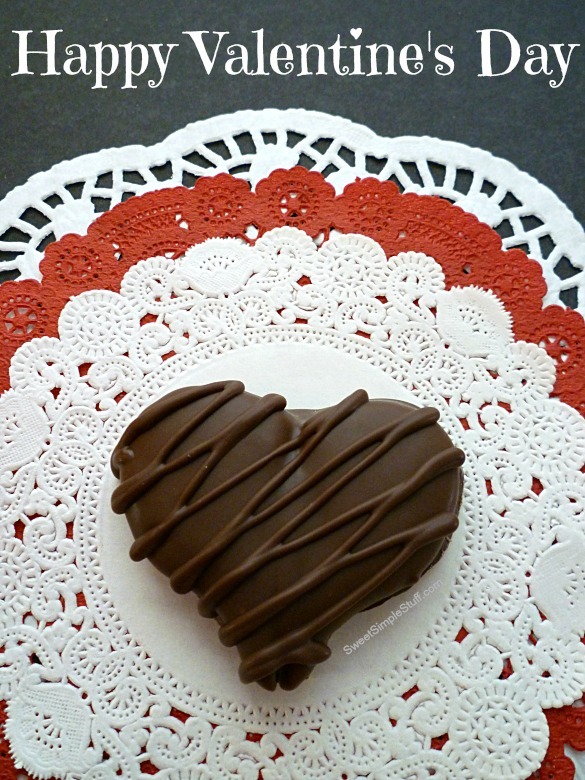 To form one whole heart … I dipped one half in melted candy, tapped off excess chocolate and placed it on wax paper … dipped the other half, tapped off excess chocolate and placed it so that it touched the first piece and attached as the chocolate hardened. Chill for a few minutes. I cleaned up uneven edges of chocolate with a small sharp knife … then added decoration. To form two halves … a.k.a. 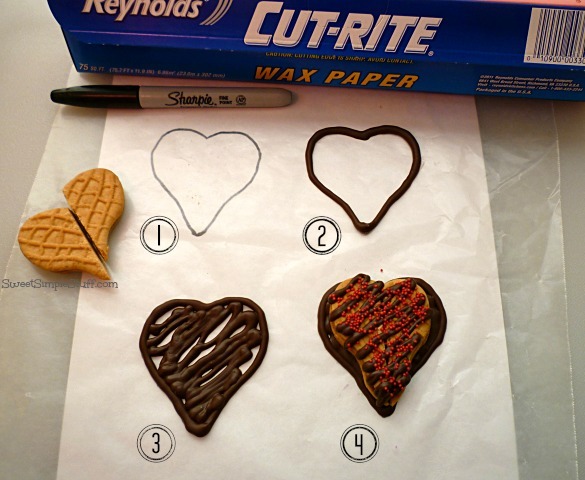 a broken heart … I followed the same steps but did not let the two pieces touch on the wax paper. Can you tell that it’s made from a Nutter Butter? Sounds scumpdillious! I love nutter butters too – surprised, right? YOU ARE A GENIUS!!! This brilliant, simply brilliant. Almost makes me want to have a broken heart, Brenda. Thank you Kathleen 😉 This is the ONLY kind of broken heart to have! You continue to amaze me with your creations. Love all the hearts. They look so easy,even I could do it. Thank you for sharing with us Brenda. I’m imagining chocolate arrows, etc. for the hearts. 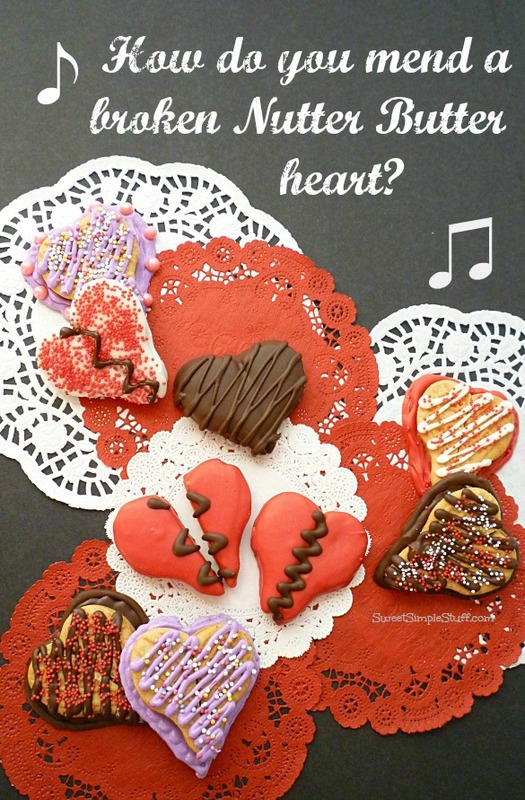 Bet even the Nutter Butter head honchos never thought their cookies would make into hearts. Big pat on the back for you. Thank you so much Tavette :). You have to check the blog Sunday morning … I have more ideas! I believe that your idea would work … dip carefully so that everything stays together! Beyond genius! They laugh because your genius makes them nervous! Awesome!! Thank you Dinaz :). So that’s why they laugh, LOL! Thank you so much Sue 🙂 Will you talk to my family, LOL! Oh, how very creative and what a genius you are. 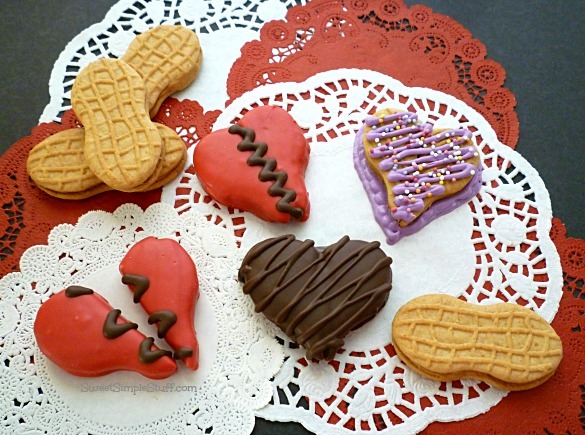 Those heart cookies are adorable. No wonder you can’t sleep some nights………your thinking about your next creations. 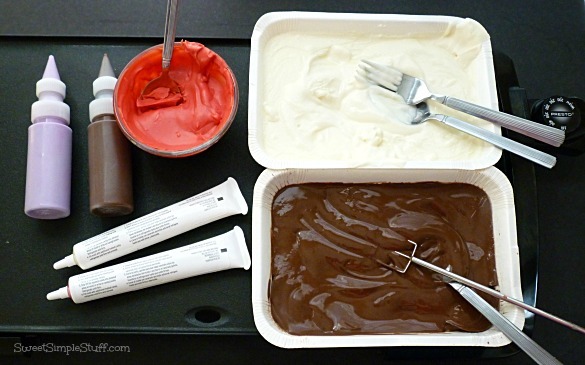 Love your idea of using your electric griddle for melting all your chocolates. I don’t have one so always melted each one separate until I seen using the crock pot idea. Hi Colleen in Texas! I have never tried the crock pot, but heard that it works great. Electric skillets work too! 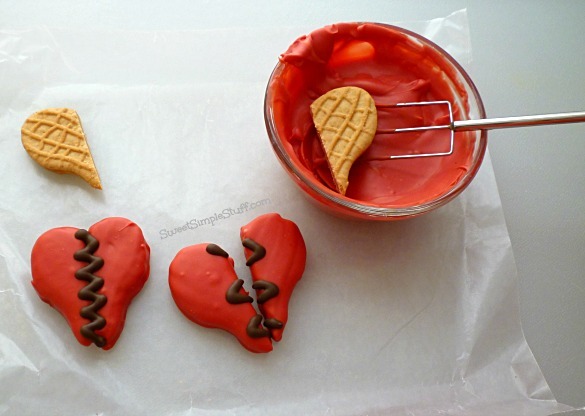 I heart Nutter Butters and I totally heart Nutter Butter Hearts. These are fantastic!